This coastal scenic drive begins in Monterey and travels to San Luis Obispo. To reach Monterey from San Francisco, head south on CA-1 for spectacular views, or if you are in a rush, use US-101 until you reach the scenic CA-68 in Salinas. Monterey is a destination all by itself. The world-class Monterey Bay Aquarium (A1) on Cannery Row is a must-stop. Steinbeck’s Spirit of Monterey Wax Museum (M2) is next door and features over one hundred characters from California’s history and Steinbeck’s Cannery Row book. Cannery Row becomes the aptly named Ocean View Boulevard as you head west where you can stop at Lovers Point Park (H1) or the magenta accented Pacific Grove Marine Gardens Park (H3). For beach access, we recommend the Monterey State Beach (W1) where you can swim, surf, explore tidepools, beachcomb, kayak, scuba dive, and of course, enjoy a romantic stroll on the beach. The Asilomar State Beach (W2) also offers beach access, as well as coastal hiking and a boardwalk loop through a dune. Monterey has several other museums to learn about the area’s rich history. The Monterey State Historic Park (A2) displays some of the city’s historic buildings, including California’s first theater. Maritime Museum of Monterey (M1) focuses on the shipping impact on the community. Bird and butterfly enthusiasts will enjoy the Pacific Grove Museum of Natural History (M3) with its collection of more than 400 local bird specimens and a special tribute to the monarch butterfly. The nearby George Washington Park (H4) is a good location for natural bird and butterfly viewing. While here, we recommend two side-trips. The 17 Mile Drive (T1) brings you around the Monterey Peninsula to Pebble Beach and the famed Pebble beach Golf Links. A toll is charged. The second side trip is up Jacks Peak Road (T4). This twisty road leads to Jacks Peak County Park boasting almost 8.5 miles of horseback riding and hiking trails, cathedral-like forests and stunning ridge top vistas. The Skyline Self-Guided Nature Trail traverses the summit of Jacks Peak and features fossils from the Miocene epoch. To reach it, follow Aguajito Road, turn left onto Monhollan Road and right onto Jacks Peak Park Road. 3 miles south of Monterey is the village of Carmel-by-the-Sea. Swathed in natural beauty blended with upscale shopping, galleries and Wine Spectator Awarded restaurants, Carmel truly is California’s Jewel City. The pristine white sands of Carmel City Beach (W3) make it very popular for swimming and surfing. To the south, the Carmel River State Beach (H5) is an ideal stop for picnics, hiking, and bird watching, but keep in mind that it is not safe for swimming. Don’t miss Carmel-by-the-Sea’s Scenic Road (T2). To catch it from CA-1, head west on Ocean Ave and then turn left on Scenic Road, where you will drive along the coastline past Carmel River State Beach (H5) and Carmel City Beach (W3). Visit the Carmel Mission (M4) for its spiritual, natural and historical beauty or the home of poet Robinson Jeffers at the Tor House (A3). Heading south on the Pacific Coast Highway for 4 miles, you will reach Point Lobos State Natural Reserve (W5), considered by many to be California’s best park. The Monterey pine, the rocky shoreline, the 80-foot high kelp forests, and the undersea ecological reserve are just part of the natural splendor. Hike through the forests or walk along the beach, where you can explore tidepools, coves, and rock formations, and perhaps spy sea lions on the beach or sea otters on the nearby sea stacks. There is a strict number of visitors per day to the park, so arrive early for your best chance to enjoy. Continuing south on California Highway 1 for a few miles, you enter the Big Sur region which continues for the next 90-miles. The road was opened in 1937 and some areas climb as high as 1,000 feet above sea level. One easily accessible beach is in Garrapata State Park (H6). Like most beaches along Big Sur, the Pacific Ocean is too rough for swimming but is ideal for whale and sea otter watching. The park is aptly named the Spanish word for tick, which are very common between the spring and fall. Further down the Big Sur scenic drive, the Soberanes Point (V1) is the main viewpoint in the park and offers panoramic views of the Pacific Ocean. Stretch those legs while hiking some of the coastal bluff trails leading to coves and hidden beaches. 6 miles south on CA-1, you will reach the Bixby Creek Bridge. Turnouts before and after allow you to stop and explore the bridge. The nearby 12-mile Old Coast Road (T5) is a scenic, unpaved road through the forests and canyons that will meet back up with CA-1 at Andrew Molera State Park (H7). This side-trip is not recommended if it’s recently rained. Continuing south on the Pacific Coast Highway, consider stopping at the Point Sur State Historic Park and Lighthouse (A4) for the 2-hour walking tour through the park and the lighthouse. In 3 miles, you will arrive at the Andrew Molera State Park (H7). Here you will enjoy over 20 miles of trails through coastal redwoods and big-leaf maples, sea-cut cliffs, meadows overflowing with flowers, rivers, and over 2 miles of sandy beach. You will soon reach the Big Sur settlement and one of its highlights is the not to be missed Pfeiffer Big Sur State Park (H8). Hike through redwood forests or visit Pfeiffer Beach by heading west on Sycamore Canyon Road. In 10 miles, Julia Pfeiffer Burns State Park (H9) offers more than 2400 acres of mountains and forest, including some coastal redwoods. You can walk up a paved trail to the picturesque 80-foot tall McWay Waterfall, or picnic on the beach popular with brown pelicans. The road clings to the coastline for the next several miles. 18-miles from the Julia Pfeiffer Burns State Park, consider a side trip to on Nacimiento-Fergusson Road (T3). This 25-mile, paved road through the Santa Lucia Range offers amazing hairpin curves and spectacular views of the Pacific Ocean and the Santa Lucia Mountain Range. This road ends at US-101. Under a mile south on California Highway 1, the Willow Creek Picnic Area (H11) offers expansive views of the Pacific Ocean and picnic area. In 4-miles, Sand Dollar Beach (W4) just off Jade Cove is well known for its jade deposits and romantic seaside walks. 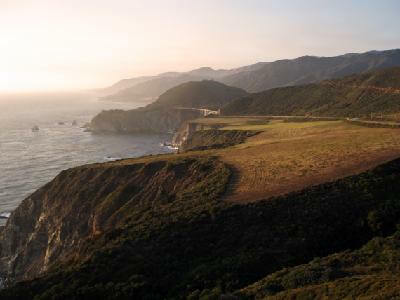 The Big Sur scenic drive travels alongside the Pacific Ocean with spectacular views in every direction. As you descend from the heights at Ragged Point you will notice a lighthouse in the distance. This is the lighthouse at Point Piedras Blancas (A7). Completed in 1875, it was originally 115 feet high, but the structure is now missing its lantern room and the current tower is 74 feet tall. Adjacent to the lighthouse is one of nature’s wonders. Here since the late 1990s elephant seals have been coming ashore to give birth, mate and molt. Upwards of 4,000 seals inhabit the site during the breeding season that runs from November through February. You can stop here and walk the length of the boardwalk and view life in the rookery going on several feet below. The site is open all year round with docents present every day from 10 A.M. to 4 P.M. during breeding season and on weekends and holidays at other times. Parking and entrance are free. In 3-miles, you arrive in San Simeon. Visit the Hearst Castle (A5), home of newspaper magnate, William Randolph Hearst. Designed by architect Julia Morgan, the masterpiece was donated to the State of California in 1957. 7 miles ahead, Moonstone Beach (W6) is a perfect stop for exploring tidepools or hiking. The beach is named after the moonstone agates and California jade found here. Continuing south for 23 miles, Morro Bay State Park (W10) is home to the 576 foot tall Morro Rock for which the bay is named. While you cannot climb the rock, the state park allows you to get close and provides beach access. During whale watching season, this stop is a must! Our Morro Bay Scenic Drive explores Morro Bay, home of the Museum of Natural History (M5) and more than 250 species of birds, including black oystercatchers, great blue herons, and peregrine falcons. The drive continues south on California Highway 1 until it intersects with US-101 in San Luis Obispo, one of California’s earliest settlements. To continue this adventure, explore San Luis Obispo Wineries or continue heading south on US-101 on our Malibu to Lompoc Scenic Drive towards Santa Barbara, Los Angeles, and San Diego.